New Yorker Bagels is the world’s largest baker of fresh baked bagels. If you’ve eaten a bagel in New York City, chances are you’ve enjoyed a New Yorker bagel. 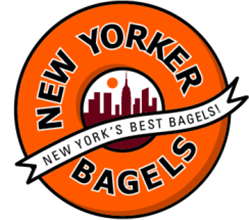 We have provided decades of service to shops, bakeries, cafes and hotels throughout the New York area, and we're now proud to offer Free Overnight Shipping of our New York City bagels to everyone in the Continental US-of-A! All our bagels are fresh, never frozen, and use only the finest all-natural ingredients with no preservatives and no bromates. Every New Yorker Bagel has a crisp shell and a chewy center, just as the perfect bagel should. Our bakers are dedicated to sending you the most delicious, all-natural bagels in the world. Each bagel we send you is hand-rolled, one at a time.